« Should You Buy or Sell a 52-Week Low ? 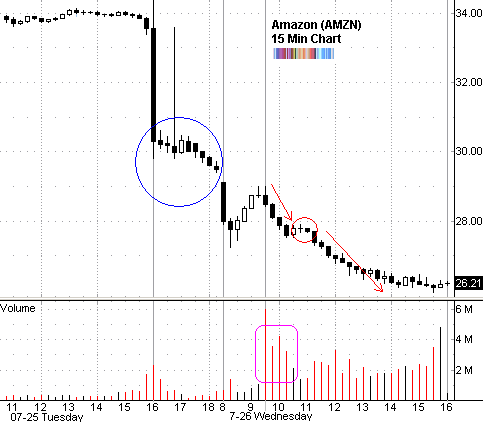 Amazon’s plunge actually took place yesterday in after hours trading (blue circle) but carried over to today’s session. The after hours session yesterday was a tell that we would see anything but a usual day for Amazon today. And with volume spiking to more than 11 times the expected (purple square), it was anything but usual. If you were really quick on the trigger and wanted to get in on the action you could have watched the pre-market trading and shorted AMZN right at the opening candle. The last candle in pre-market was a reverse hammer-like candlestick, which after the weak run up meant that buyers had exhausted themselves and a change in trend was probable. It also provided a defined risk entry at its low ($28.70) with a stop at its high - which incidentally was very close to the high of the pre-market trading ($29.01). The next opportunity to go with the trend and short AMZN came at 11:00 am when price contracted and a narrow range candle offered a very defined risk entry (red circle). Also notice that volume had dried up as price had recovered. From there, price expanded downwards right into the close. I am interested to know what tools do you use to do all the charts and draw the arrows? They look very good and professional. Is the tool available for data outside of US? Ken: I use Qcharts and regular Windows apps available to everyone.